Good luck! I published my 2009 NaNo novel this year and plan to publish last year’s next year. And I’m doing it again this year! So it can definitely be the start of something good. Just be sure to spend time you’re not writing thinking about writing. I got some good ideas for scenes while in the bathtub and commuting to work. If you have a good idea, 1,667 words will fly from your fingertips in an hour or less. If you don’t know what you’re doing, you’ll spend hours mindlessly playing Solitaire. In that case, it’s better to step away from the computer and spend your time thinking. Oh, is this your first blog post on here? Welcome! 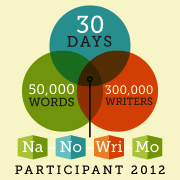 I look forward to your NaNoWriMo updates.